Image Size: 9.5 X 14.75 in. Created in 1960, The Flintstones have often been compared to early television shows such as The Honeymooners, particularly because of the characterizations of buddies Fred and Barney and the affable relationship between Wilma and Betty. 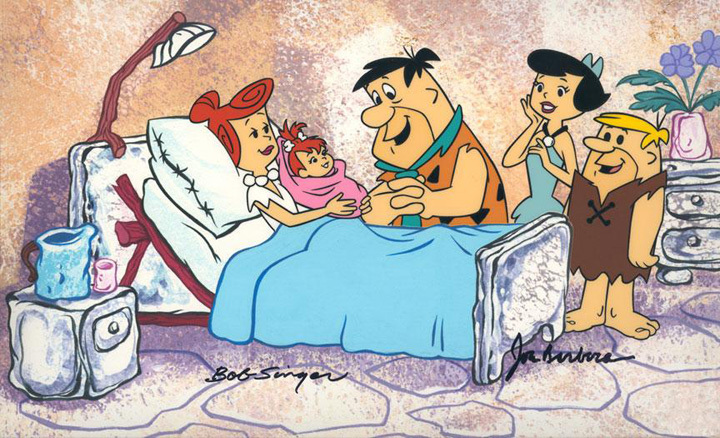 Taken from Episode 83 of The Flintstones “The Blessed Event” is about the birth of Pebbles to Fred and Wilma on February 22, 10,000 B.C. The edition is hand-numbered, and has been hand-signed by legendary animator, Bob Singer.